Dates are a sweet fruit that grow on the date palm. Mostly likely originating near the Persian Gulf, date palms have been a staple food source in the Middle East and northern Africa for thousands of years. They were introduced to Mexico and California by Spaniards in the mid-18th century. The name 'date' derives from the Greek word daktulous because of the fruit's elongated shape. Dates are popular either fresh or dried. A naturally low in mositure fruit, dates are dense in valuable nutrients. Dates are a good source of Vitamin A amd potassium. They are also high in folate and dietary fiber. 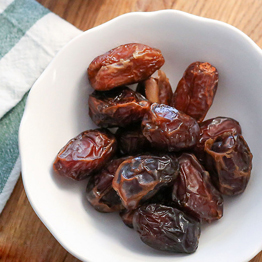 Dates are best stored in a cool, dark pantry or refrigerated.